It’s been a whole month since I’ve reviewed a G.I. Joe figure. I think that must be a record for this site. All of my Joes are packed away for the coming move along so they’re not as easily accessible for photos as they once were. But the other day another package from the G.I. Joe Collector’s Club arrived in the mail. This one containing my 7th and 8th figures from the sophomore figure subscription service (FSS). It would be easier to just keep these guys in their packages until after the move but I opened them up for you, my faithful readers, so that I could post this review. This latest shipment of figures consisted of Night Force Lt. Falcon and Cesspool. Falcon was not a figure that I was excited about but Cesspool was one of the figures I was most looking forward to from FSS 2.0. The first Cesspool was released in 1991. This was a few years after I had stopped collecting Joe figures as a kid. By ’91 the line was becoming gimmick heavy with multiple sub-teams. 1991 brought us the Air Commandos, the Sonic Fighters and the brand tackled environmental issues with the inclusion of the Eco-Warriors. The Eco Joes were brightly colored and featured water spraying weapons and color change plastic. The environmentally conscious Joes were led by Flint, the Joe team’s Warrant Officer who was already a well-established character. Their opposition on the Cobra side, Toxo-Vipers and Sludge Vipers, were led by a brand new character, Cesspool, a crooked businessman with a penchant for pollution. 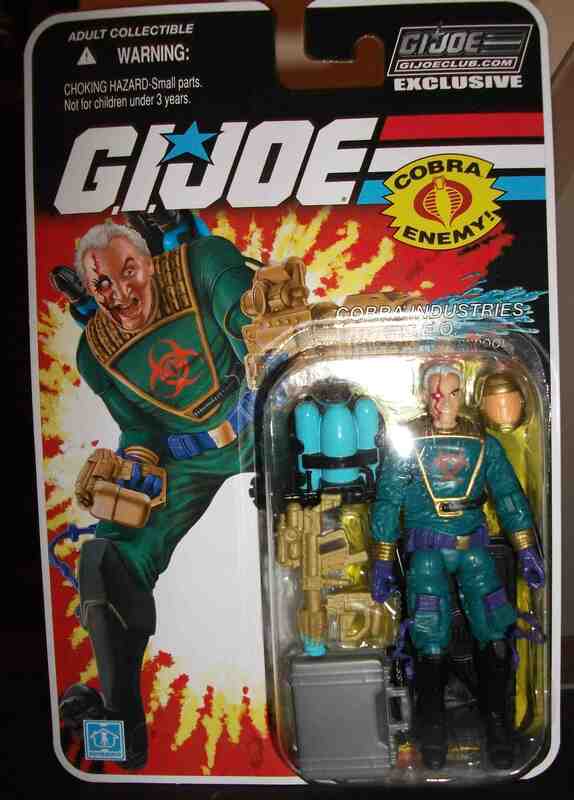 Even though I was not collecting Joes at the time I thought Cesspool made for an interesting addition to the Cobra ranks. 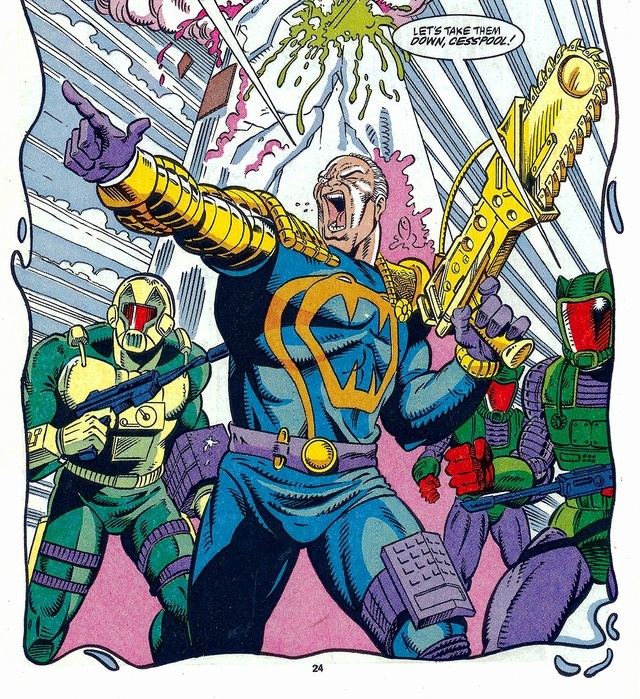 The Cobra army consisted mostly of nameless troopers so it was nice anytime a new “name” Cobra character was introduced. The white hair and grotesque scar on his face gave him a look quite different from any Joe figure we’d seen before. Cesspool and the other Eco-Warriors seemed to make little to no lasting impression on most Joe fans. They had a few brief appearances in the comic book and the DIC cartoon but were then forgotten. None of the new characters introduced in the sub-set were ever revisited in the new-sculpt era or in the modern line; until now. Since I have no nostalgic attachment to the character, Cesspool was not a figure I was clamouring for, and yet he’s exactly the kind of character who I like to see included in the FSS. I love how the club doesn’t shy away from any era of Joe with their character choices. Cesspool has such a unique look and an interesting backstory that I’m sure he’s got a few fans out there. He’s a character that I’m happy to add to my collection. 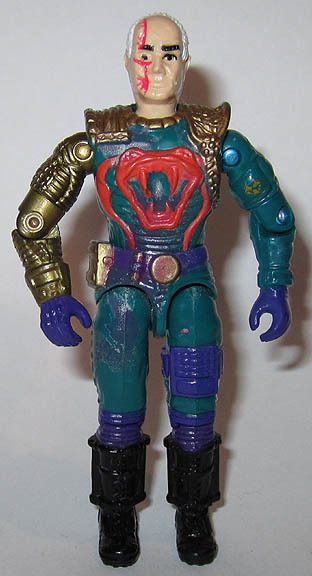 Cesspool’s body is made up of a mish-mash of parts from previously released figures such as Sci-Fi and the Techno-Viper. The parts work well together but they don’t do a great job of replicating the look of the original figure. There are a few key elements missing such as the massive cobra emblem on his chest and his metallic golden arm. However the paint job is very well done and ties all of the mixed parts together nicely. 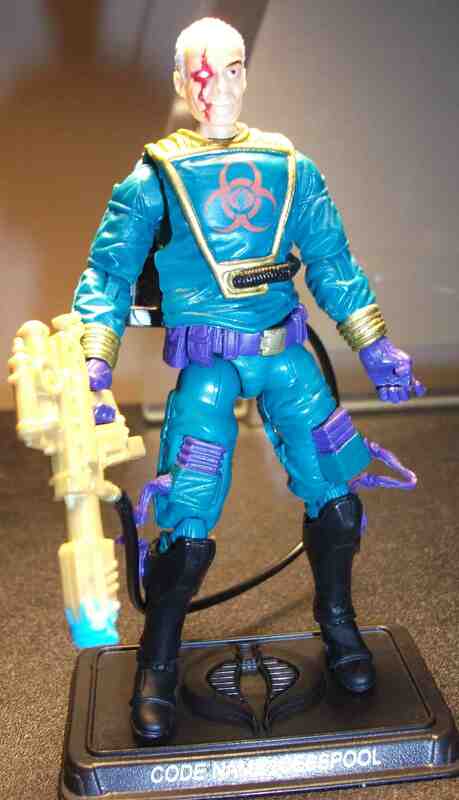 I actually prefer the new biohazard logo on his chest plate to the old Cobra logo. 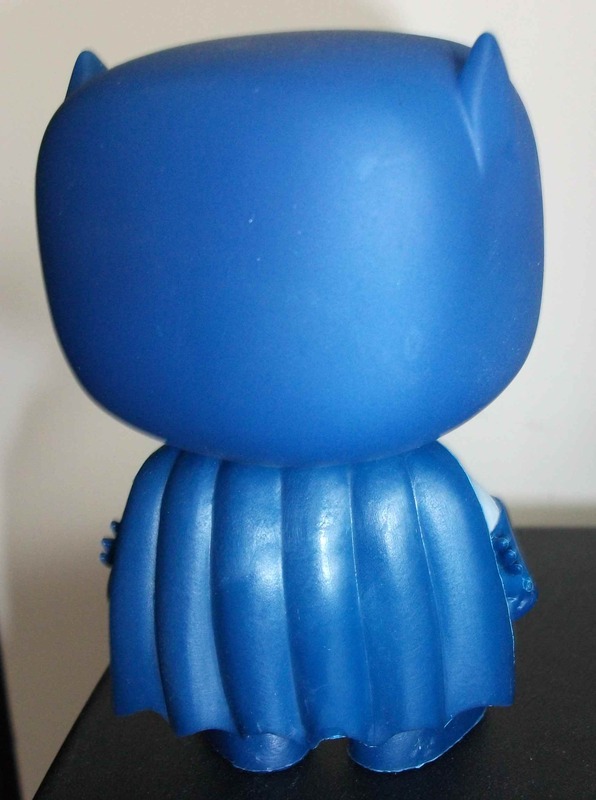 Since Cesspool has such a distinctive face the Club had no choice but to sculpt an entirely new head. They really knocked it out of the park on this head sculpt. Cesspool looks fantastic. The evil sneer and that nasty scar, which looks worse than ever, give this figure a ton of personality. The way he’s depicted on the backer card art is also amazing. He looks full-on insane and that seemingly open wound makes me want to look away and cringe. However, if you aren’t a fan of his ugly mug you have the option to display him with his helmet on . The helmet is gold with an orange visor and it’s very Cobra Commander-esque. I’m quite torn as to how I should display him. 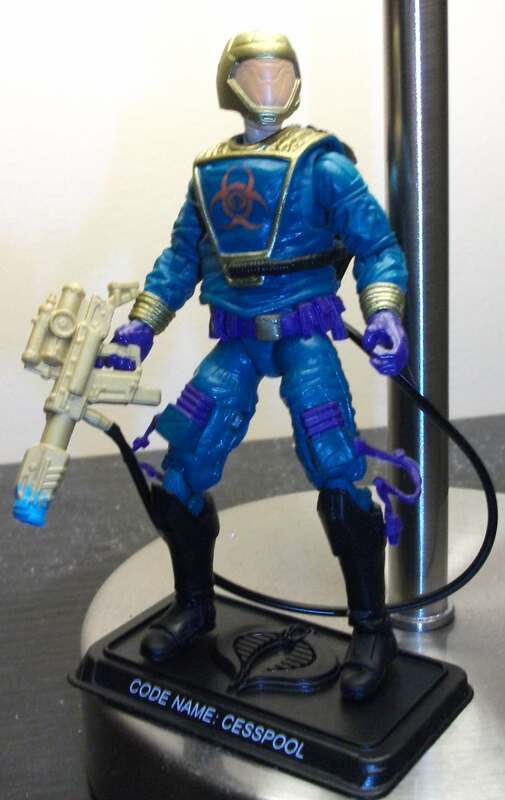 For accessories he comes with a repainted version of Barbecue’s backpack, a sludge gun and hose, a smaller sludge pistol, and a suitcase full of money. This figure is the new highlight of FSS 2.0. My crap photos don’t do it justice. 9 out of 10. Back in November one of my all-time favorite movies, Tank Girl, was released on Blu-ray. Unfortunately none of the retailers in my area bothered to stock the bluray on its release date so I had to turn to ebay. I found a guy who had the movie for a decent price but I always feel gouged on the shipping charges. In order to justify the shipping costs I bought 2 other blurays from him, Godzilla vs Biollante and a Bush concert. And then I waited. Weeks turned into months and no movies arrived. I contacted the seller in early January and without hesitation he refunded my money ( though the movies finally showed up in the mail last week and now I feel guilty). Anyway, the refund sat in my paypal account rather than being returned to my bank account. Paypal sent me reminders every other day to spend the credit. At that point it felt like free money so I went back to ebay to find something to spend it on. I suppose I could’ve just sought out another retailer selling those DVDs but I was in the mood for some new figures. I wasn’t hunting for anything specific at that particular moment so I turned to my old “to buy” lists that I keep for multiple toy lines. My DC toy list hadn’t been touched in a while so I figured it was time to whittle it down by a figure or two. I always try to find a seller with at least 2 items I want so that the shipping doesn’t seem so bad when split between them. 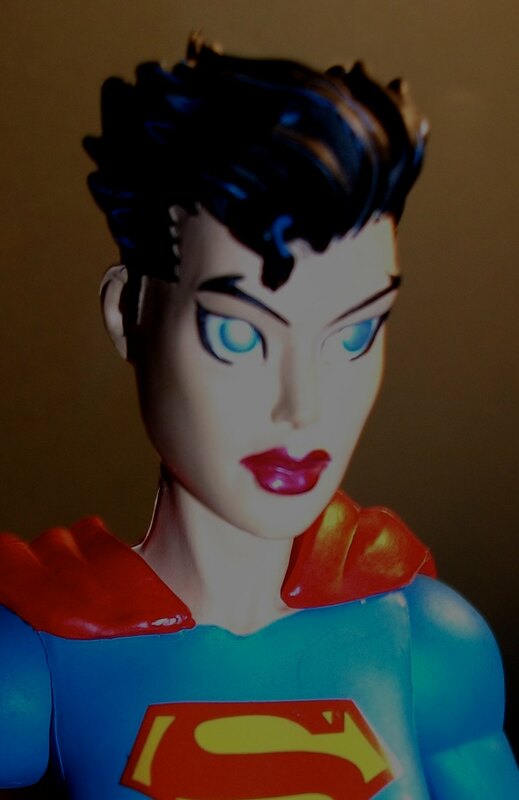 After a lot of searching I found a guy that had 2 of the figures on my DC want list: Braniac 13 and Superwoman. The Brainiac is awesome but I’ll talk about him another time, today I’ll be reviewing Superwoman. Now you might be wondering, “Who the hell is Superwoman?” Sadly, even though this figure was on my “want list”, I can’t really tell you. I know very little about her, but truthfully I don’t think there’s much to be known. This figure is from the Vengeance toy line produced by DC Direct. It’s based on a 20o5 storyline from the Batman/Superman comic that was written by Jeff Loeb and illustrated by Ed McGuinness. When it comes to Jeff Loeb, I can take him or leave him, but when it comes to Ed McGuinness I would buy just about anything with his name on it. I love his art and have told you so in past reviews of toys based on his artwork such as Red Hulk and Superman. Both of those figures did an excellent job of representing Ed’s unique style in 3D. 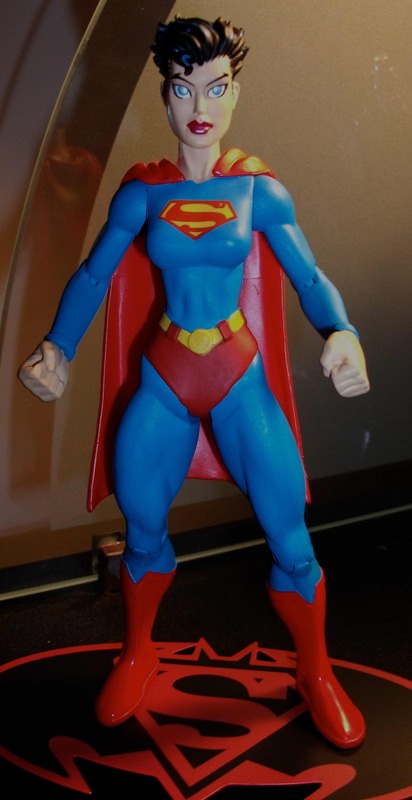 This Superwoman figure doesn’t do as good a job but it’s still pretty decent. The Vengeance storyline featured multiple variations of Batman and Superman from alternate realities. This Superwoman and her corresponding Batwoman herald from Earth 11 where they are literally Batman and Superman as women. 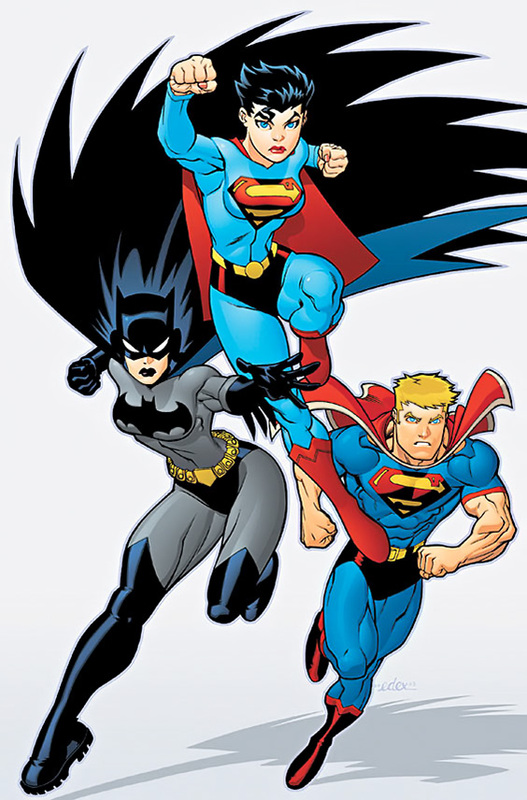 There was no elaborate backstory provided for these characters but Superwoman’s real name is Laurel Kent. Even though they were just a flash in the pan ( I think they appeared once more) and far from original, the Superwoman and Batwoman from Vengeance struck a chord with me. 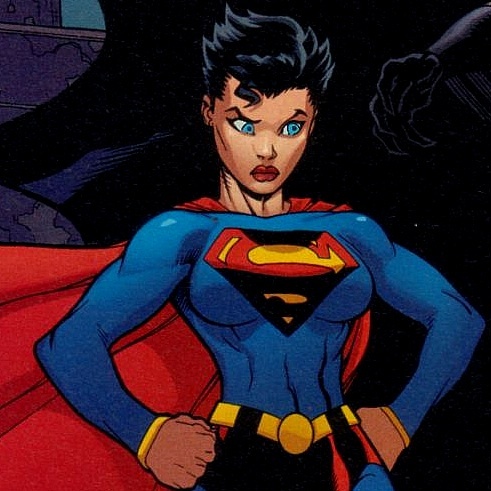 I generally prefer brunettes to blondes so I found this Superwoman, with her cropped black hair and tights, a nice change from the short skirted blondes who usually don the red and blue. I thought this character looked great when McGuiness drew her but his “just right” amount of cartoonyness didn’t translate quite right into this action figure. It’s a little too cartoony looking for my tastes. The big anime eyes are in such stark contrast to the squinty, barely there eyes of the male characters in the McGuinness series. The proportions might seem a little off but it’s indicative of the artwork that inspired it so I don’t mind the oversized thighs and skinny waist. 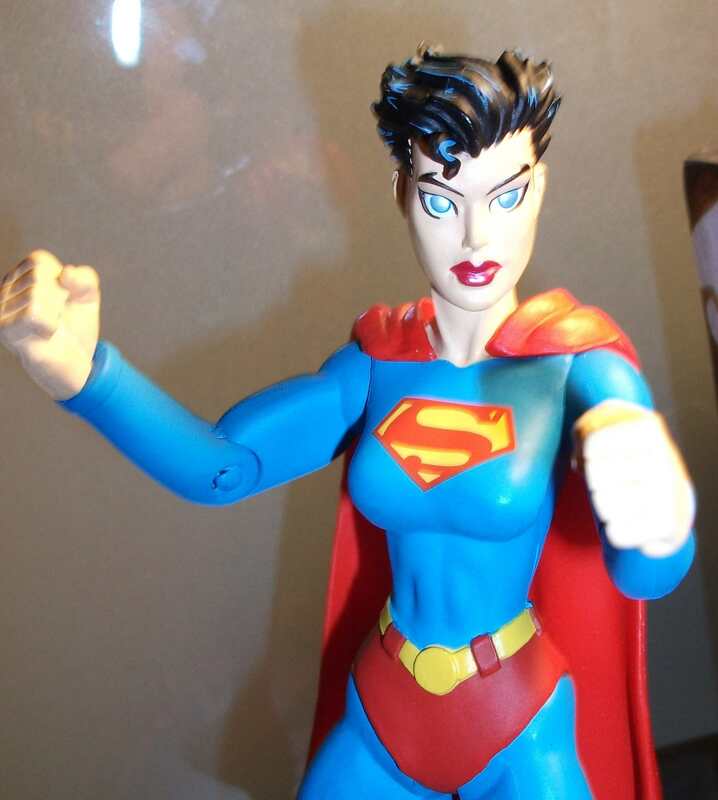 The paint job is nice but I wish her outfit was painted in the same metallic blue that was used on the Superman figure as it would tie them together nicely. Articulation is lacking but that’s too be expected on a DC Direct figure. Like all the figures in this line she came packaged with a Superman/Batman hybrid logo display stand which is pretty cool. 7 out of 10. In my last review I talked about the Iron Spider-Man doll gifted to me by my good buddy Andrew. Today I’ll be reviewing the birthday gift I received from my brother Doug. My big bro got me a vinyl Pop! 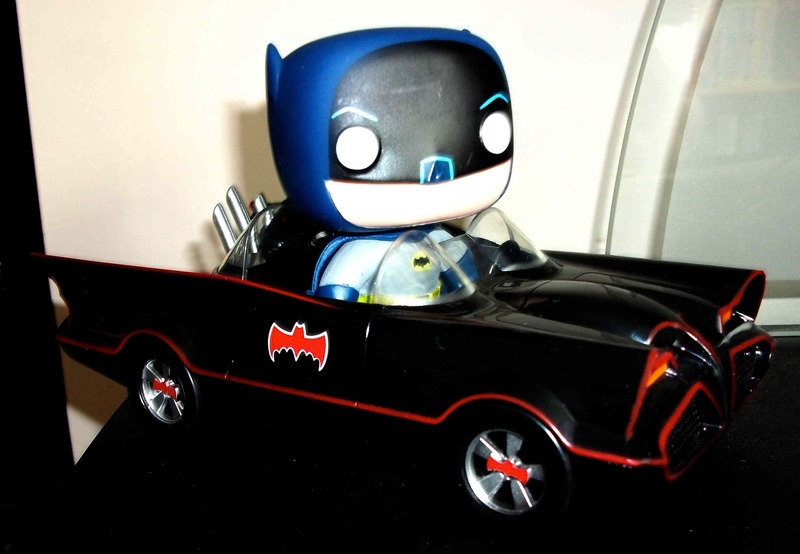 figurine of Batman and his Batmobile. I was reluctant to embrace these Pop! figures at first but once they proved themselves to be more than just another short-lived cutesy flash-in-the-pan, a la Mighty Muggs or Blammoids, I accepted them whole heartedly. My collection is now 11 strong and growing. The diversity of the properties keeps this line fresh month after month. Just this week Strange Adventures (my local comic shop) stocked Pop! figures based on the classic Planet of the Apes films and the Goonies. I’m sure I’ll be adding some of them to my collection soon. The first Pop! figure I ever acquired was Batman. I’m not even a BIG Batman fan, at least not when compared to other heroes like Spider-Man or Silver Surfer ( Neither of which do I have in Pop! form) but for whatever reason that cute little Batman just really appealed to me. He’s been protecting my work desk from crime for a couple of years now, along with fellow Justice Leaguers Flash and Green Arrow. I have a sizable list of Pop! figures that I’d like to own. Vanessa whittled my list down by two by getting me Spikor and the Governor for my birthday. Had Doug asked me which Pop! figure I’d like next I probably would’ve told him to get me one of the ninja turtles or Robo-Cop. Another Batman wasn’t exactly high on my list. But I’m very glad that Doug didn’t ask me. I can, and will, eventually buy myself those other figures. 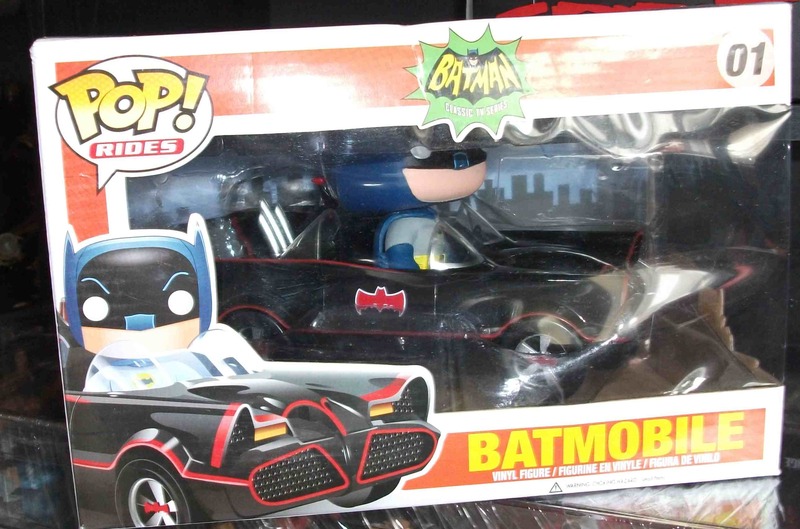 But I never would’ve bought this Batman and Batmobile for myself. Not only because I already have a Batman figure but also because of the nearly $40 price tag. But this figure is rad and I would’ve been missing out. 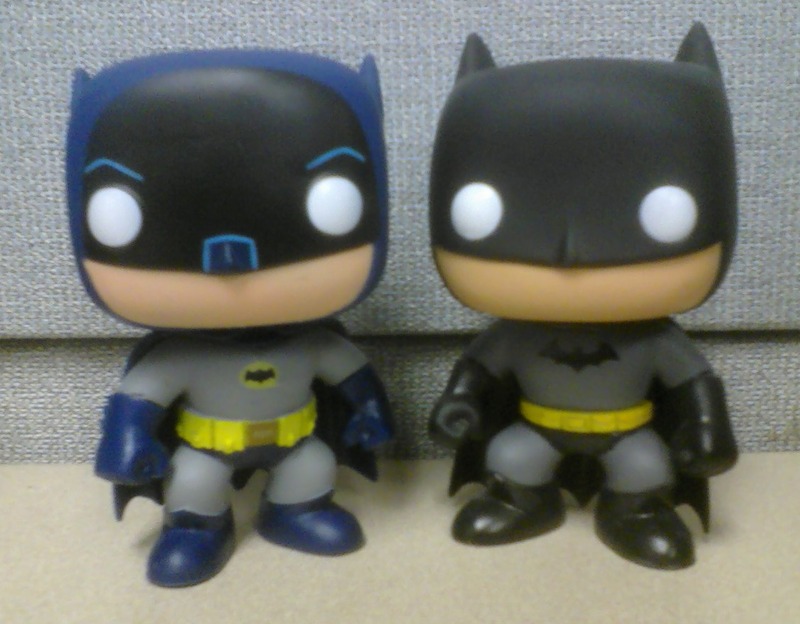 The Batman I got years ago was black and gray, based on his comic book look. The black and gray version is probably my favorite Batman costume and it seems the best default look for the character in my opinion. This new one is based on the live action TV series from the 60s starring Adam West. 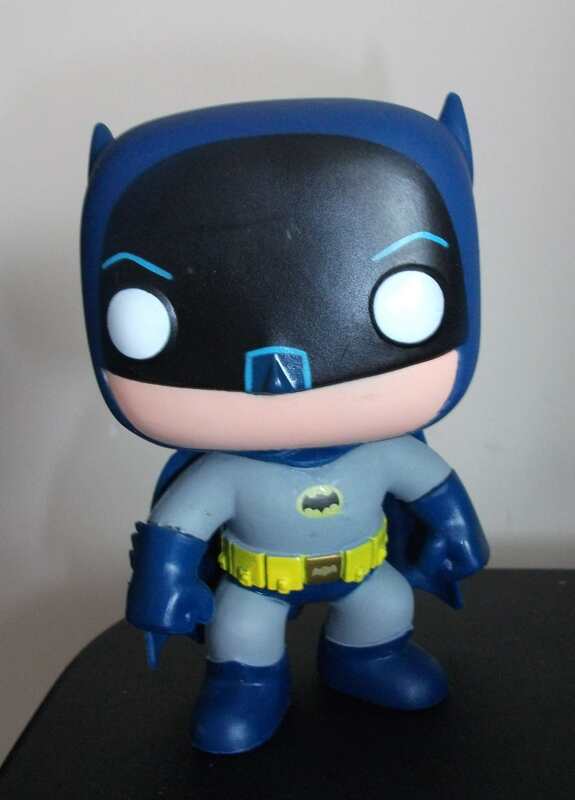 Now while I wouldn’t want Batman to wear this costume in the comics necessarily it’s still an iconic costume and it looks fantastic in Pop! form. At first I assumed this was the exact same mold as my other Batman, only painted differently, but once I got them side by side I realized that this was a completely new sculpt. The utility belts are different, the capes are different lengths, and the 60s one has shorter ears. The paint job on this Batman is what really elevates it above and beyond my other figure. The classic blue and gray compliment each other nicely. The black face circle is present, and just like on my recently reviewed bendy Batman, it allows for some epic painted mask eyebrows. The lighter blue used for the brows and around the nose really make his features, for lack of a better word, pop. His utility belt is bright yellow with a gold buckle. Funko didn’t have to go that extra mile to have a gold buckle but they did and it’s appreciated. Then there’s the Batmobile. 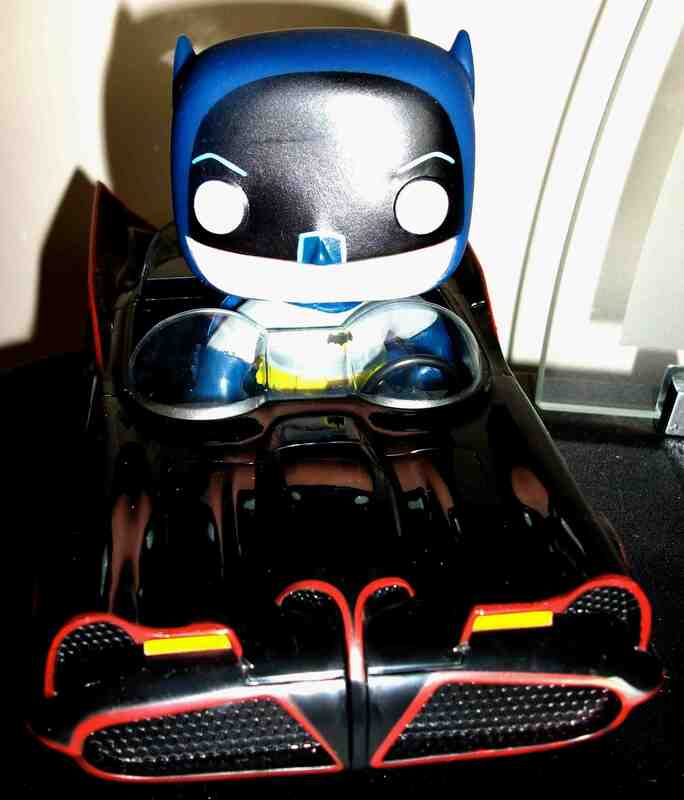 This thing looks awesome and is my first ever Batmobile toy. 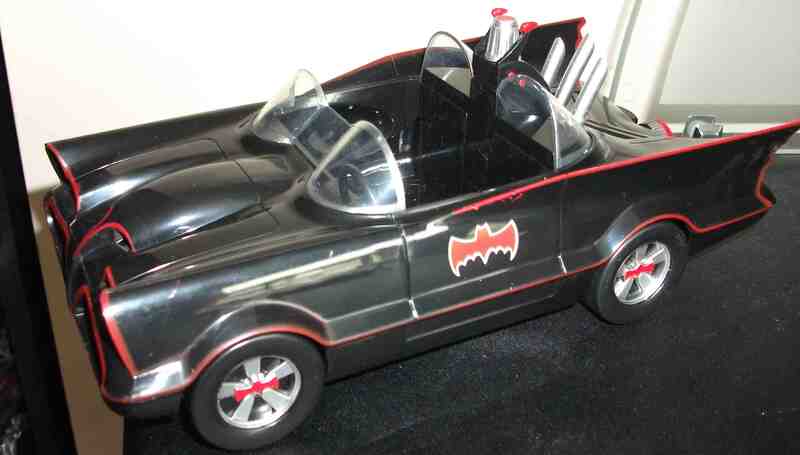 And when it comes to Batmobiles there’s no beating the 1960s TV version. This thing looks great on my work desk and everyone stops to admire it. It’s sculpted in a glossy black so it’s shimmery and reflective as though Robin just waxed it. There’s a surprising amount of sculpted detail on this thing. 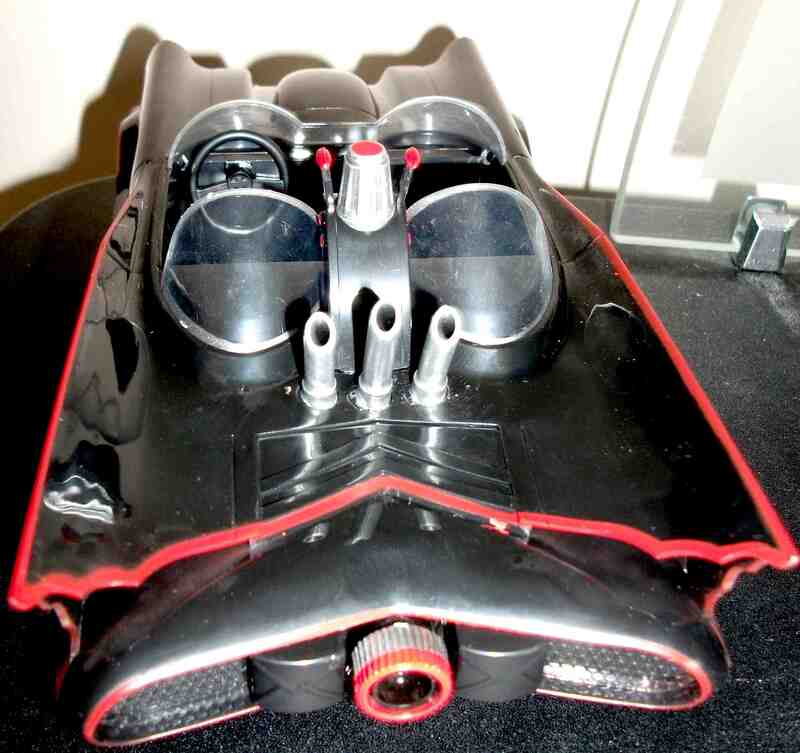 There’s the bat symbol hubcaps, the clear double windshields, the tail fins, the exhaust pipes, and even a steering wheel. I love it. My only gripe would be that the wheels don’t turn. However, it’s not like I was gonna go driving it around on the floor anyway. Since it just sits on the shelf above my desk at work as a display piece the static wheels are probably good thing as this way I don’t have to worry about it rolling off and smashing into a dozen pieces. Another great present from Doug. 10 out of 10. And, sidenote, it’s Dougie’s birthday today. I’m on my way to meet him for lunch and give him his birthday present. Hopefully he likes his as much as I like mine.